Another ride of small climbs south of Lake geneva. But if you do enough smallish climbs it becomes a big one. And today was a fairly big ride. 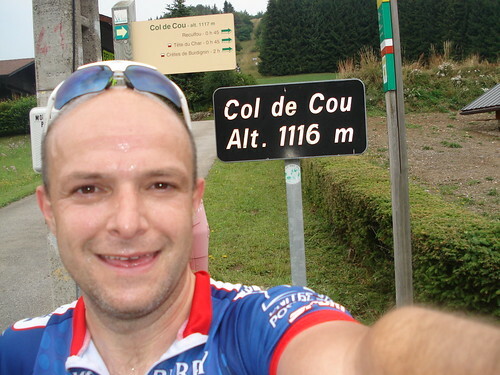 Col de Cou was the lowest rated ride in my book so I wasn’t expecting much, but instead of the main way I found a very nice small steep road up. Over the other side a quick visit to the nearby Col des Moises then down through the lovely Vallé Verte region. Then the small Col de Saxel. But a turn left at the top and there is a great 6 km steep stretch up to Monastère. And no surprise at Monastère – a nice old monastery perched up high. In summary a 52 km loop with over 1200 metres of climb (4,000 feet) and a little rain to keepme cool. Hi Will. Your website is brilliant I really appreciate the information you are sharing. My girlfriend is from Bonne, near Annemasse and I’ve done a couple of climbs from your website most notably La Saleve from Entrembieres. One question about col de saxel. I have done this a couple of times from both sides, but never got to the Monestre. Last time I turned to go to the Monestre but the road goes into Forrest and is shaded which meant Ice on this day. Is the road tarmaced all the way to the Monestre or does it turn to a track? Hi Jon, The road is paved until the Monastery. That’s the end of the road. Thanks Will. Next time I’m here I’ll go up. I’ll be having a beer at the top of Ramaz so will probably miss you at the finish on Col de la Joux Plaine. Like others, many thanks for all the posts – brilliant. I reply on this post as I am also a local and climb Saxel 10-15x a year – my favorite and always a guage of my progress. Do you know the Grimpee de Voirons? It’s coming up on May 28…I’m around so maybe I’ll do it for fun. 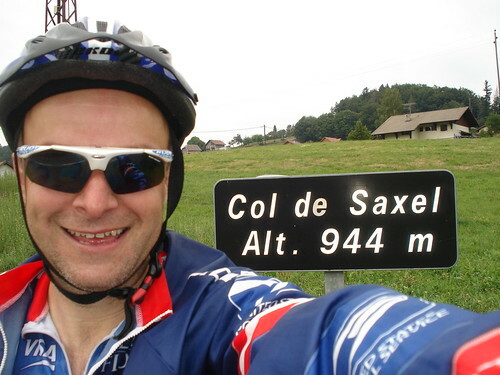 The section I do not know well is from Col de Saxel up to the monastery – do you have a profile you could share? Wow, it’s 10 years since I posted this. I seemed to have invented selfies, before moving on to more interesting photos. Here is a profile from Saxel to Monastère. (an excellent web site by the way). Thx for the note, I should visit here again this year.